Ernest Nagamatsu (first place), Ruben Guevara (second place) and Satsuki Yamashita (third place). 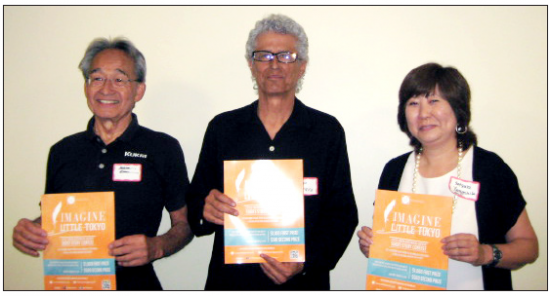 As part of its activities celebrating the 130th anniversary of Little Tokyo, the Little Tokyo Historical Society (LTHS) announced the winners of its inaugural short story contest at a recent reception held at the Japanese American Cultural and Community Center in Los Angeles. Ernest Nagamatsu’s “Doka B-100” won first place with a cash prize award of $1,000. Second place and a $500 cash prize went to Ruben Guevara’s “Yuriko & Carlos,” while Satsuki Yamashita’s “Mr. K” received third prize and $250. The competition, called “Imagine Little Tokyo,” solicited fictional entries that best captured the setting and spirit of this area of downtown Los Angeles, a symbol of the larger Japanese American community. Each finalist received a special commendation based on artwork created by Kimsun Vong and a Mr. Ramen gift certificate. The top three winners’ short stories will be published in the print edition of The Rafu Shimpo. All 15 finalists’ works will be posted on the Japanese American National Museum’s Discover Nikkei and the Little Tokyo Historical Society websites. At the reception, actors Ken Narasaki, Geoffrey Rivas, and Ping Wu presented the top three works, adding dramatic life to the written words. Short story judges were Academy Award winner Chris Tashima; former JANM CEO/President Akemi Kikumura Yano; and Grateful Crane executive producer Soji Kashiwagi.